Drug Cocktails #Infographic ~ Visualistan '+g+"
Drug interactions and side effects are shockingly common- even for drugs that are properly prescribed by a physician. Nonetheless, most people don’t feel the need to tell their physicians they take acetaminophen occasionally for a headache or an herbal supplement, because those things are sold over the counter and they aren’t dangerous. Turns out, even unregulated herbal supplements can cause dangerous drug interactions, so they aren’t so benign after all. 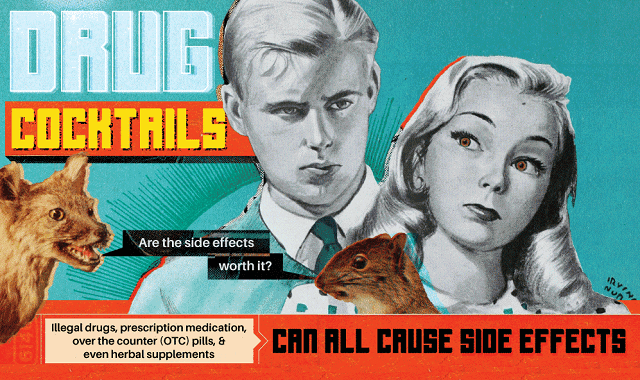 Learn more about drug interactions from this infographic!